I've decided to write as mummy is a bit busy. She is flapping and sighing and muttering a lot this week. I think she is a bit stressed. As you can see I am even having to man (rabbit) the phones. She promises to write in the next couple of days with details and photos of her trip to the Spring Fair, and with details of a lovely lavender giveaway she has received from Sue over at Our New Life In the Country. Oh my goodness Humphrey you are just adorable! Tell you mummy there is a *PINK GIVEAWAY* going on over at my blog if she wants to join in. 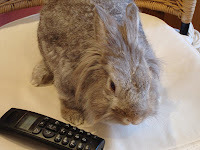 What a star rabbit you are Humphrey to 'rabbit' the phones while your Mum is busy, so nice that she has a good bunny to fall back on in times of need. Tell her from me to up the carrot ration...you've earnt it!! You must be so busy preparing for the fair! Humphrey looks so sweet, holding the fort. What a beautiful bun. He has such a mane, he's like a mythical mix of lion and rabbit ... a rion or a labbit! oooohhhh no - being too busy is not good. Love the Humphrey on the phone - that reminds me of the old BT adverts.... or was that Busby?? Mmmmmm....maybe Humphrey was the milk advert?? - oh I don't know, I'm useless - I know!! Hey there Humphrey, its good to meet you. What a handsome bun you are. Humphrey you are doing a most excellent job!